Last weekend, I simplified my website. As a consultant and speaker, I was focused on marketing those services. Now that I'm an ALA department head, I've decided to use the website as more of a placeholder for my resume and broad professional activities. I may still tweak it a little: my largest body of work is my newspaper column site: LaRue's Views. These days, I do my blogging here, so it might make sense to give those destinations and perhaps a link to my book, a little more prominence in the menu. Suzanne tricked me! She told me she was getting an award this evening at the Castle Rock Town Council meeting for her work on community reference. I thought, "Well- deserved, and about time!" So I even put on a sport coat (under my winter coat), and we braved the snowy roads. But when we got there, the two local Rotary Club presidents in fact presented me with an award - the 2015 Castle Rock Rotary Clubs Person of the Year award, "in recognition of his service to the people of Douglas County by building an Outstanding Public library System." I was totally surprised. I have not been the director of the Douglas County Libraries for two years, and in fact have spent most of my attention far outside Douglas County. But I remain very touched: ultimately, this is about the recognition and appreciation of the library as a community asset. Several Rotarians came up afterward to tell me that their whole idea of what a library could be had changed; they now saw it not just as a topnotch, professionally competent place to gain access to the world's knowledge, both print and digital, but as a vital community hub. The reputation of the library was strong; they knew it to be a responsive, engaged, trustworthy, and thoughtful institution. Some of those Rotarians - Al Wonstolen, Les Lily, Richard Bangs - had a lot to do with my civic education. At some point, I realized that it was not all about the library. The library was just one more tool to help make a great community. Thank you, Castle Rock Rotarians, for this honor. I share it with many, many others: the board that hired me, the boards that worked with me, the staff responsible for so many great ideas and execution of them, and the community itself. And now DCL leadership has passed to a new group of people, and I have every confidence that they will take it even higher. Meanwhile, Suzanne should have gotten at least an acting award. The official announcement has now gone out: on January 4, 2016, I will assume the directorship of the American Library Association's Office of Intellectual Freedom, and the Freedom to Read Foundation. I will be following the very able Barbara Jones, who has headed the OIF for the past 7 years. Before her was Judith Krug, who founded it. So I will be only the third person to hold the position - a great honor. As Director of ALA’s Office for Intellectual Freedom (OIF), James LaRue will work with ALA’s Intellectual Freedom Committee (IFC) and Committee on Professional Ethics (COPE), as well as the Intellectual Freedom Round Table (IFRT). OIF provides information to individuals and organizations facing intellectual freedom challenges; plans and promotes initiatives that promote intellectual freedom, privacy and free access to information (including Banned Books Week); and, works closely with others, including the ALA Washington Office, on core information policy issues. The OIF Director also serves as the executive director of the Freedom to Read Foundation, an allied 501(c)(3) organization, and as secretariat for the LeRoy C. Merritt Humanitarian Fund. Meanwhile, I'm moving to Chicago (New Year's road trip! ), where I already snagged a little apartment just a couple of blocks from the Lake, and within walking distance of my new job). I will look for ways to get back to Colorado on long weekends and such. Suzanne, who is still working, will stay here. In many ways, I feel that I have been training for this position all my life; it is in fact one of my life's passions. I've met my boss (Mary Ghikas), and my five-person staff, and I can tell they'll be great to work with. So I find that I'm already "listening" to the world in different ways. If you have concerns about intellectual freedom - access to the content of our culture - I'd like to hear about them. 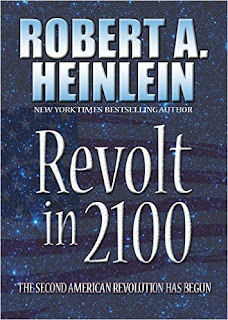 Recently, I downloaded the ebook, "Revolt in 2100 (note the blurb: "the second American Revolution has begun") by Robert Heinlein. Mostly, it includes the "If This Goes On" novella, in which America is taken over by Nehemiah Scudder, the First Prophet, who establishes a tyrannical theocracy. But I was reading the last piece in the book, "Concerning Stories Never Written: Postscript." "...the idea that we could lose our freedom by succumbing to a wave of religious hysteria, I am sorry to say that I consider it possible. I hope that it is not probable. But there is a latent deep strain of religious fanaticism in this our culture; it is rooted in our history and it has broken out many times in the past. It is with us now; there has been a sharp rise in strongly evangelical sects in this country in recent years, some of which hold beliefs theocratic in the extreme, anti-intellectual, anti-scientific, and anti-libertarian. "It is a truism that almost any sect, cult, or religion will legislate its creed into law if it acquires the political power to do so, and will follow it by suppressing opposition, subverting all education to seize early the minds of the young, and by killing, locking up,or driving underground all heretics. This is equally true whether the faith is communism or holy-Rollerism; indeed it is the bounden duty of the faithful to do so. The custodians of the True Faith cannot logically admit tolerance of heresy to be a virtue. "Could it be otherwise here? Could any one sect obtain a working majority at the polls and take over the country? Perhaps not -- but a combination of a dynamic evangelist, television, enough money, and modern techniques of advertising and propaganda might make Billy Sunday's efforts look like a corner store compared to Sears Roebuck. Throw in a depression for good measure, promise a material heaven here on Earth, add a dash of anti-Semitism, anti-Catholicism, anti-Negroism, and a good large dose of "anti-Furriners" in general and anti-intellectual here at home and the results might be something quite frightening... The capacity of the human mind for swallowing nonsense and spewing it forth in violent and repressive action has never yet been plumbed." He wrote this while living in Colorado Springs, Colorado in 1953. "The idea of a sun millions of miles in diameter and 91,000,000 miles away is silly. The sun is only 32 miles across and not more than 3,000 miles from the earth. It stands to reason it must be so. God made the sun to light the earth, and therefore must have placed it close to the task it was designed to do. What would you think of a man who built a house in Zion and the put the lamp to light it in Kenosha, Wisconsin?" 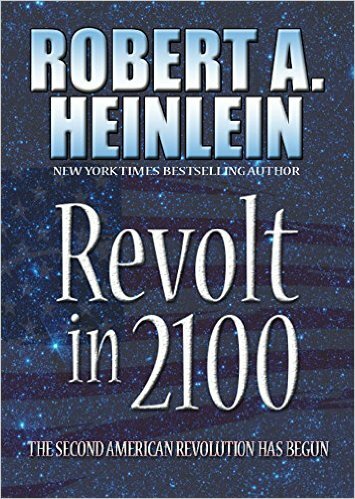 Heinlein was writing in the days before Focus on the Family, Donald Trump, climate change denial, and the "all lives matter" rhetoric. Heinlein said he was just writing to entertain, in order to buy groceries. But it's hard not to take it all as prescient parable. And warning.